It is no secret our politics are often divisive and lacking in civility. In this environment, it is easy for public service professionals to blame the challenges we face in serving our various publics on a broken political system. But to do so is a cop-out. Instead, our field must return to our core values and work to address the needs of our citizens despite the state of our politics. Some background: Several years ago, I attended a Public Administration conference where the keynote speaker proudly declared that the bureaucracy is a not a problem in the United States. Rather, he stated, it is politics that is holding back our administrative institutions. The speaker went on to say public administrators should not be faulted for failing to solve political problems. Unless politicians step up to the plate, he continued, public servants will continue to be powerless to address the wicked challenges facing our country. The speech bothered me at the time, and it continues to bother me today. We in the Public Administration profession are not powerless. Political control of bureaucracy is a reality of life in the public sector, and though it can make our work more challenging, it reflects a core value of a democratic society. As Woodrow Wilson wrote many years ago, “wherever public opinion exists it must rule.” Sometimes those opinions are uncomfortable, misinformed or downright ugly. Sometimes those opinions are objectively wrong. But the vote of the citizen with the objectively wrong opinion is worth the same as everybody else’s …just as it should be in a democracy. Given this, what is a public administrator to do? The advice I give to my students is that a simple commitment to five values that, when lived, can make Public Administration professionals positive change agents regardless of political realities. The first value is transparency. The easy way to be transparent is to follow all public meeting and open record laws, and ensure your agency follows its own policies for publicly posting information. The right way to be transparent, in my opinion, is to proactively reach out to citizens. To ensure the customers of government are involved in the processes leading up to key decisions, and to ensure all information is presented in a way understandable to a non-expert. Transparency is not a simple data dump, rather it is ensuring that information is both in the public domain, and readily accessible and digestible for average citizens. The second value is accountability. Now accountability is a bit of a loaded term; ask ten people what it means for “government to be accountable” and you will likely get a wide range of answers. 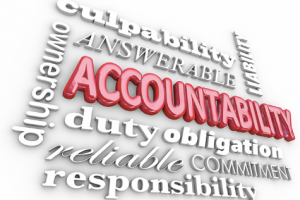 I suggest public administrators look within in regards to accountability. In other words, ask yourself daily, did my actions fulfill the legal mandate of my organization? Did my actions positively impact the quality of life of the people I serve? Did my actions meet the quality expectations I set for myself? Most important, if the answer to any of these questions is no, why not, and what will I do tomorrow to be accountable? The third value is responsiveness. When people complain about government being slow or distant, I find they are often reacting to political paralysis. Being responsible as a public administrator means validating the concerns of your customers, responding to their communications in a timely manner and keeping the lines of communication open as you work to resolve their issue. Equally important is an honest and prompt explanation when an issue cannot be resolved. The fourth value is humility. As Michael Lipsky pointed out thirty years ago, people are often vulnerable when they interact with government. People also do not like to be made to feel stupid or confused. Navigating the complexity of government is hard enough for those of us who live it on a daily basis, we cannot expect the public to be able to navigate it blindly. I encourage my students to put themselves in the shoes of the person they are interacting with, to embrace the fact that their training and expertise does not give them a monopoly on good ideas and to really take the time to listen. I fully realize a commitment to these values does not negate the reality of political control of bureaucracy, nor address the very real resource and capacity challenges faced by public agencies. But remembering and acting on these values, which are embedded in the very DNA of the Public Administration field, will enable public servants to maximize their impact regardless of the state of American politics.